MidiCi, pronounced Mee-Dee-Chee means “You Tell Me” in Italian. We offer fully personalized pizzas baked-to-order in a traditional wood-fired brick oven made from the stones of Naples. 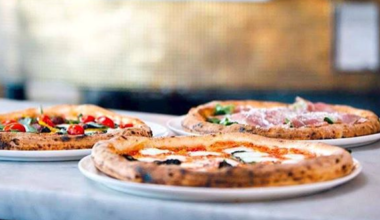 Staying true to its Neapolitan roots, the pizza dough is created with only four fine ingredients – double zero and Neapolitan flour, sea salt, pure water and yeast. Garnishes are derived from authentic crushed GMO-free Neapolitan tomatoes, “white gold” mozzarella di buffala and Italian cold-pressed extra virgin olive oil. MidiCi also serves hand-tossed salads, small bites, desserts including Nutella® pizza, coffee, beer and wine. Take advantage of daily lunch and happy hour specials.